Vintage One: 20 years of Mtn Bike passion and counting. 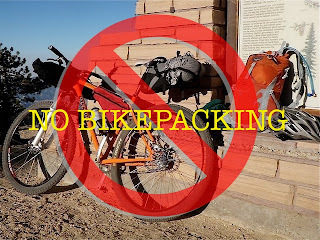 : No Bikepacking Allowed...sort-of. After watching this very cool video, it brought back to me the painful reality that I have gotten in zero meaningful bikepacking trips this year, other than one early outing to try the new tarp shelter. SO for me, this pic symbolizes the whole thing: No bikepacking for Little Grannygear. Sigh. Part of it the fact that it is darn hard to get anyone committed to doing it with me. Yeah, talk is cheap and that is all I get...talk and promises. "That sounds like fun! I would like to do that sometime..." And just when is 'sometime', anyway? Later on then this year, it would seem. Bikepacking is a decent solitary endeavor, but it also is better with two, both for safety and sharing the experience. In the meantime, I will keep refining my kit. I need to get a warmer yet light bag and I think I am a good candidate for a quilt. I am pretty sure I can do it from an inexpensive down sleeping bag re-sewn into a quilt. I saw this on the net and it was already in the back of my mind too. Someone beat me to it. If I could get a good enough deal, I would just buy one all done, but criminy they are costly. I want it to be under 2lbs and good to 30 degrees. I have the bivy, so that takes the rating into the high twenties and that is good enough to me. The next big thing is a better sleeping pad than the old 3/4 Thermarest I am using. A good pad is $$ too but I appreciate more pad comfort these days as the bones grow older. No dashboard/windshield guards as sleeping pad for this guy. No thank you. I still am looking for some CF pole sections about 4' long that I can cut and sleeve to rid myself of the center pole set-up on the SilShelter. I know how I want to do it and it should work really well, but I need to get the material and CF is perfect. I have the ti tent stakes now and the rigging worked out pretty well for the tarp. I still need to get a piece of Tyvek for a ground cloth and that is just a matter of ordering it off of ebay, etc. No biggie. Then I am pretty set unless I want to cook hot meals or tea and that will mean a ti cup and UL stove. Of course, the irony of all this is not lost on me...that being the act of buying and refining gear that I am not using. Well, I have been ironic before, so nothing new there. The bad thing about being in So Cal is the summer is not so great. Hot, dry, and buggy, Spring is short and really Fall is likely the best of all. So, in some ways, I look for better climate or higher elevations to do this stuff. Well, I will press on following that tiny dream and make it happen at some point. Granny, I am hoping to do my first bikepacking trip this fall in San Diego. I have quite a bit of light backpacking gear, but would undoubtedly need some bikepacking specific gear as well. I have two young boys under 5 years old and know how tough it is to carve out time and how much it stinks to be away from the family. If you ever would want to bikepack in San Diego, let me know. I am thinking if I can set a date now for sometime in November, I should be able to get everything lined up by then. Letting the genie out of the lamp?